If I haven't always claimed the name, I have been a writer for longer than I can remember. I scribbled stories on scrap paper from my grandfather's printer and on the backs of math worksheets. I made up elaborate stories while playing with my younger brother and then grilled his memory to record them at day's end. I filled seventeen journals between the ages of 10 and 18. I piled them up on a closet shelf and in a drawer in the window seat of my bedroom as my words consumed the pages. I wrote about the mundane details of life one day and the next started sketching out a story. I began my first novel in 1999, when everyone knew the world was going to end. If life as we knew it would be over, I thought I may as well shape the life that would follow. In middle school, I decided to interview my maternal grandmother for a school project of some sort. I flew towards her house on my still-new bike, reveling the power of my legs as I anticipated the power of my mind. I imagined the winds of change coming. This was it. This story about my grandmother was to be the making of Stephanie Lang, Writer. I had my Serious Journalist black and white composition notebook tucked under my arm (acceptable for note-taking only) and a pen in the pocket of my denim shorts that stabbed my thigh each time I pedaled. As I sat on the carpet in front of my grandmother's blue floral couch, I heard stories about my grandparents as young teenagers; learned that my grandmother didn't speak English until she went to grade school. The story began to shape itself as I rode home. I was confident. I was happy. I was a girl with a mission and a passion, and I vowed I'd stay true to that little self no matter what life threw at me. After four years writing and editing for my high school newspaper, though, I no longer wanted to barge into the lives and tragedies of others and tell their stories. I wanted to tell my own stories. I certainly had enough of them bouncing off the walls of my imagination. Still, my brief time as a reporter had given me my best friend, my first writer's conference, and invaluable practice and instruction in interviewing, writing, editing, and page layout. As I grew my career in publishing and as an editor, I discovered ways to help others tell their own stories. Along the lines, as I engaged in this important work, I neglected my own stories more often than not. They sat in unopened notebooks and buried in my Google Docs list. I've been doing a fair bit of writing lately, for myself, privately and quietly. I'm not yet sure where to take some ideas that have been swirling, and, quite honestly, they sit forgotten because I have chosen to funnel my attention and energy into the problem-solving episodes of real life. You know the ones, they refuse to be ignored. I'm still writing. I just haven't been sharing that writing, or making ambitious plans for the words that result. But, I still want to. I still need to. A bit of that young girl's ambition has resurfaced in the last year. It's time to do something with it. Back to school season is officially ON. The last school district in our area has now been back for more than a week, and a sense of fall leaves is in the air. This time of year always leaves me a bit nostalgic for the era of fresh new notebooks, backpacks, and back-to-school clothes. It's been a few years now since I completed my master's, and I sometimes I miss being a "student." Fortunately, my line of work keeps me learning. Whether my assignments are academic articles or novels, each new project offers something new. The excitement of new beginnings never fades. Recently, I've talked about finding inspiration and working in the quiet moments. Today, in honor of the back-to-school season, and the return of fall TV, football, and increased hours spent indoors, I'm sharing some thoughts on time management and how I tune out the oh-so-tempting distractions that constantly threaten my work time. Time blocking is an invaluable technique I use to schedule my workday. Working for myself on top of a job outside the house and having a family, I have to be diligent about separating work from play. I have several non-negotiable blocks of time with my family each day. Non-negotiable means non-negotiable. During these blocks of time, I don't check email. I don't have drinks with the girls. I don't network. I don't run errands. Having blocks of protected time allows me to remain in the moment with my son and also makes me more productive during my work time. I know I'm not missing out on any time with my son, and that frees up tons of brain space for actual work. This function on my iPhone is a tool I use to assist with my time blocking goals. This setting will silence all phone calls, texts, and mail and app notifications for a set period of time. (There is an option to allow communications from certain contacts or successive calls from the same number to come through). I have a chunk of time blocked off overnight automatically, so that even when I am up with the baby, I am not tempted to pull out my phone and read an incoming text or email that truly can wait a few more hours. I found that I often would open my phone only to respond to a text: Then I see I have three new emails and two Twitter notifications. Once I've got Twitter open, I'm done for. I used to waste huge amounts of time this way. So, I've recently begun to do employ Do Not Disturb times throughout the day, when I am up against a deadline or am finding my attention span particularly short. Since I work at the computer, it is not enough to block distractions from my phone. Fortunately, I've discovered a new WiFi router system that comes with access controls that allow you to block any site you wish. If I am unable to access Twitter anywhere, I can't get lost down the rabbit hole! In addition to silencing distractions, Luma's unique surround WiFi router configuration boosts the speed of your internet--so the sites I do need to access during work hours come quickly and reliably. Fast and reliable WiFi is an enormous time-saver. Household chores are a constant distraction and potential derail-er of my work time. I'm useless if my work space is messy, or if I can see the mess in other areas of my house while I'm at work (out of sight, out of mind, right??). My desk is set up in a part of our home that doesn't see much daily activity outside of my work. This means there is minimal clutter, so I can't procrastinate by "just straightening the room." Finally, I always keep some snacks at my desk: chocolate of some sort and something salty (nuts, pretzels, crackers). Before getting to work, I make sure I have a glass of water and a cup of tea at hand. Again, the idea is to keep myself in my seat at my desk. Once I get up, no matter the reason, all bets are off. I will encounter a distraction. What have I left off the list? What are your biggest productivity snags, and how do you overcome them? Kicking the week off a bit differently here. 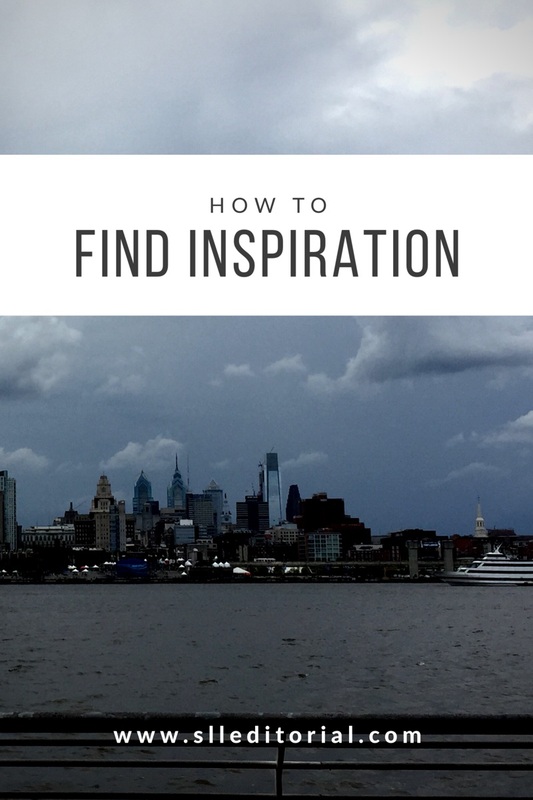 Where do you find inspiration for your writing? I find my life so full some days that it's hard to hear myself over the clatter. I've mentioned the quiet moments--they help a bit with concentration, but inspiration is often elusive. I do first need to find a quiet space. It doesn't have to be quiet around me, but I need to be somewhere that no one needs anything from me. I can't engage with anyone else if I'm trying to tune into myself. If I've found quiet, I pull out my notebook and make myself start to scribble. Even if I'm writing something like this: "I don't know what to write about. I don't have anything to say. My mind is blank. I don't have any ideas..." Inevitably, it will lead to something. Okay, so I'm feeling a little overwhelmed at the moment. Not all that inspiring, but maybe there will be something to that laundry list of complaints that I can return to some other time. For now, I want to change my focus. I think about what makes my heart race. What terrified me recently? I think about what catches my breath. What made me reach for my son's hand? My husband's solid arms? I think about what makes me laugh. What pranks did my college roommates pull? How many times were we locked out of the apartment and stuck for hours with nothing to do? What filled our moments then? I force myself to get something on the page. And then, if I still notice that I am doing the work of writing, if I haven't fallen into the hole of my scene or my story, I take a break. Walk the dog, watch the baby sleep. Flip through a magazine or watch an episode of a television show. Or, I imagine I'm telling my son a story (or, actually tell him one if he's awake). Children's stories don't really need to make sense. They can be disjointed and full of wild and crazy characters and pointless plots. There's no judgment. The act of putting a series of words together on the fly is so often the way I stumble into my favorite stories. What doesn't work? Reading. I have yet to return to a piece I started if I take a reading break. I ALWAYS look up after "just a few minutes" to discover that its 2 am and the baby has woken. Oops. I also can't simply stare at the blank page and wait. In fact, usually I begin writing on a page that already has text on it. (Even if they aren't my own words on the page). This allows me to start out already feeling ahead of things. All I have to do then is keep the momentum going, free of the pressure of starting from scratch. What works (or doesn't) for you? They do exist, believe it or not. There are moments in the day where the house falls silent. The dog leaves her post at the window and picks up her bone, satisfied that the threats have been scared off. The baby sleeps deeply. These are the moments to pounce on "work." I find that I am most productive in the early morning hours and late evening. This stage of life is quite full during the daylight hours. Full of everything. Of squeaks and giggles, barks and wrestling. Of errands and cooking. Housework and conversation. Frustrations and milestones. It looks like life, sounds like life, feels like life. It is good. However, some work must be done in order to support all this living. It's rather difficult to work or create in the midst of all of these moments. So I bide my time until peace descends. Keep mental notes and handwritten ones. And then, I work. I don't always feel that I have enough time to accomplish what I'd like to, or to calmly weigh options for days as I once could. I gather my tea, my m&ms, and my slippers. I boot up my laptop and soak in the steam from the tea as I wait for the blinking place-holder line to appear in Word. At times, there are empty pages to fill. More often, there are full pages to screen, searching out homophones and typos. Preventing technicalities from ruining the essence of a piece. I don't merely "work for the weekend," usually. I love my work and it fuels me throughout the day. Writing and editing for myself or editing for others keeps me engaged in the world beyond my small circle of home, friends, and family. It keeps me learning, researching, fighting to make a difference in the world. That's what writing does. The written word can change the world. It does so quite often. Does the way you write affect what you write? I find that when writing by hand, I am able to get into the flow of things much more easily. I can find that sweet spot where my pen becomes an extension of my brain and I don't even register the words that I write until I've written them. Of course, much of this material ends up on the cutting floor, but then doesn't much of ALL material end up there? Still, writing by hand makes the act of writing feel more natural and relaxing. It also circumvents self-censorship long enough to get the heart of my scene/description/line of reasoning out into the light of day. As I watch the pages fill with my neat, less neat, and out-right sloppy script, I feel progress happening. Literally. I feel it in my fingers. This becomes a self-fulfilling prophecy. I think I am being productive, so I am inspired to continue working, and end up being productive. Write, by hand, whatever words flow from the pen. À la good old "guess and go" spelling. Make some changes by hand. Type what I've written, editing and rewriting as I go along. Print and edit by hand again. I know some can edit on-screen, and that works for me for catching glaring typos and things I can easily resolve on the fly. But for developmental editing and reorganization, I need the spatial representation of the content changes and relocations. I find I am too easily distracted when editing in digital form. What about you? What does your writing process look like? What works, what doesn't? Let me know!